In 1804 Samuel Oldknow boarded his boat 'Perseverance' and fittingly became the first man to navigate the newly built Marple flight of locks. Now, more than 200 years on, they are part of a thriving waterway that brings holidaymakers from all over the world to visit the area. 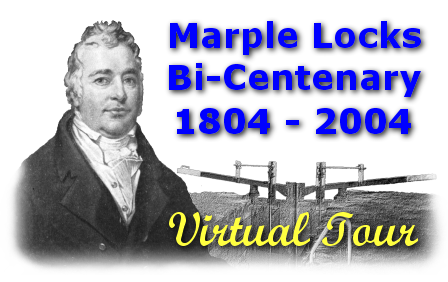 On 3rd July 2004 there was a day-long celebration of the Bi-centenary of the original building of the locks along the length of the flight and in Marple Memorial Park organised by Marple Locks Heritage Society. This Virtual Tour was orginally created to commemorate those celebrations. It's a great indicator of just how much we've risen in the short distance since passing underneath the Viaduct, which carries the Manchester to Sheffield railway line thirteen and a half feet above the canal. At Lock 4 the railway line now passes though Marple North Tunnel, which goes under the canal! Marple Locks have double gates at the bottom and a single gate at the top. About 10,000 gallons of water are needed to lift a boat through one lock and, believe it or not, this is provided by solar energy! The sun's heat evaporates water, mainly from the sea, and this re-forms as clouds. Rain mostly precipitates over high ground and collects in reservoirs, such as Coombs Reservoir high above Whaley Bridge. From here the Peak Forest Canal is kept topped up. At lock 6 there used to be a lock-keeper's cottage called Glen Cottage but it was demolished during the sixties, when the canals were not being maintained. There are several good photographs of this dating from the early 1900s. One is obviously later than the others because a conservatory has been fitted. In 2012 approximately 20m of the stone canal washwall collapsed into the pond below Lock 7. This page was added to the Virtual Tour of Marple Locks in 2017 using information provided by the Canal and River Trust following completion of extensive repairs to the wall. An ancient right-of-way from Rose Hill to Marple Bridge called Seven Stiles footpath crosses the Lock 7 locktail bridge. Its name was derived from the fact that it originally had seven stiles but these were replaced by 'kissing gates' many years ago. Several of these have now gone too. The route has been diverted three times - when the canal was built, when the railway was built and again when Marple Station was rebuilt. The stretch of towpath between bridge number 17, which carries Station Road over the canal, and Lock 8 is perhaps best know for its magnificent beech trees. In autumn these wonderful trees provide a truly magnificent spectacle and we took advantage of this for the cover of our 2004 Marple & Mellor Calendar and also for the November page of the 2005 Calendar. The official name of the bridge is "Brabbins Change Bridge" and the towpath changes sides here, although it is not a roving bridge, so the horses would have had to be untethered and the boat manhandled under the bridge using steps and a narrow ledge provided for this purpose. There is a roller on the top of the bridge on the Lock 9 side (see picture above) that was fitted to prevent the trailing rope cutting deep grooves into the stonework as the horses crossed diagonally over the road. The cottage alongside Lock 9 is another former lock-keeper's cottage and now a listed building. The owners have put a lot of effort into restoring and improving it in recent years and they've made a great job of it. In the picture below it can be seen when it was still serving its original purpose, probably in the the early 1900s. Lock 10 is a particularly intriguing area, as it is believed to be where the Tramway crossed the canal. There is certainly strong evidence in the form of deep grooves cut into the stonework of the lock that are thought to have taken the rails. However, it's very hard to imagine how this scene must have looked in those hectic days when both the canal locks and two tramway lines were operating twenty-four hours a day.